Hi PlayStation fans. I’m excited to announce that Super Stardust Ultra is blasting its way onto PS4 in early 2015 for $12.99! For those of you who aren’t familiar with the Super Stardust series, the critically acclaimed Super Stardust HD by talented developer Housemarque was originally released on PS3 in 2007, followed up on PSP and most recently on PS Vita as Super Stardust Delta in 2012. This timeless shoot ’em up has you pilot a start fighter in the depths of space, defending planets against the onslaught of enemy attacks in the midst of a deadly meteor storm. Your mission is simple: use split second timing and pure arcade skill to make every shot count and destroy everything in your path. Super Stardust Ultra, has an array of new planets, glorious visual enhancements, and includes no less than nine different game modes, including new modes and established favorites from the series and its various add-ons. With the PS4 socially connected features, you can now show the world your skills in the new Interactive Streaming game mode, letting your viewers vote periodically to change up your gameplay as they watch. Because Super Stardust has always been about achieving high scores, we have added the feature that allows you to directly send and receive challenges from your online friends; or you can simply compare your scores across the global leaderboards. If you don’t fancy flying solo, you can also compete against friends in 2-4 player split-screen battles or team up in co-op mode. 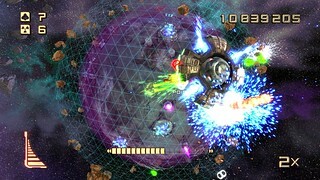 Super Stardust Ultra has been developed by D3T and XDEV and this latest edition in the Super Stardust series brings the spirit of Stardust to PS4 with new features, new gameplay, incredible depth and variety, and the best graphics possible, making it the most definitive and best version of Stardust ever! 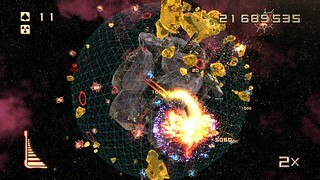 Keep checking back for more Super Stardust Ultra news, as we’ll have updates and a release date for you all very soon. If its the best version it better have 3D or no go! The game that destroyed DualShock 3 thumbsticks, now will destroy DualShock 4’s! Day freakin’ 1. No Cross-Buy Deal in this one? How come Sony? You people complaining about cross-buy DO realize this is a new game, right? Not just a port? Is there any kind of cross buy? It’s obviously not cross-buy because it’s a different game. Gamers expect too much these days. It’s a brand new entry in the franchise with several new features and new planets, so no cross-buy. Gameplay won’t change much, but still largely a new installment in the Super Stardust franchise. On topic, it sounds great. I wonder why not reveal this at PSX by the way? Not a ‘megaton’ announcement, but still always nice, isn’t it? I really hope this has the option to play this in 3D. All 3D PS4 games so far have been amazing. hopp the is NOT a new game. read the freakin blog. all they did was and a few new features and improve on the graphics . That is true, for games that aren’t published by SCE. This game is published by SCE, however. But yeah, as already has been said: it isn’t cross-buy, because it’s a new game. Not just a 1-to-1 port from PS3 to PS4 of Super Stardust or PS Vita to PS4 if it was Super Stardust Delta. Sure sounds like a new game to me. Of course it’s not cross-buy it’s a brand new game like the Vita version was different from the PS3 version, Stardust is great i look forward to buy this one. Yeah, id rather have a new game than a “complete” edition of a 2007 game. Im sure plenty of others will buy it day one, though. Is every developer just afraid to make a frraking game specifically for ps4? All i see is ports and remasters. It’s not a direct port. The game has new features/modes. No cross-buy guy. Get your reading comprehension up. Get hooked on phonics so you can get on our level. I look forward to this. Great news with this and resogun. Probably. PS3 edition ran at 1080p/60fps already, so that’s the least you can expect from PS4, unless they really add many more effects and the graphics become more demanding. Yeah, I have to SMH at everyone that believes that this is a port of old Stardust games. None of the Stardust games have been ports, to be sure. All have been original games made from the ground-up for that particular system (i.e., SS Delta for Vita). Therefore, no cross-buy. I’m sure this game will look fantastic on PS4! Loved it on Vita. Oh dear god, does this mean I have to do ‘Late Boomer’ again? It better be 3D. That game is badass in 3D and is the only way I can play it. Yes, it’s confirmed to be 3D compatible! I am also REALLY hoping this is compatible with 3D. Not to sound like a jerk, but it’s the only way I’ll buy it. I guess I’ve been spoiled by the 3D PS3 version and feel it’s the only way to play this game. Can’t go backwards now! @29 try out Trine 2 on ps4, also natively supports 3D. This game was amazing in 3D. I won’t buy it without it, D3T! I love me some old school space shooters. Played the crap out of SS Delta a while back. Wow people like millymill want things handed to them. They don’t wanna buy anything anymore. This is becoming the most spoiled generation of gaming I’ve ever seen. @13 and @27, I totally agree. 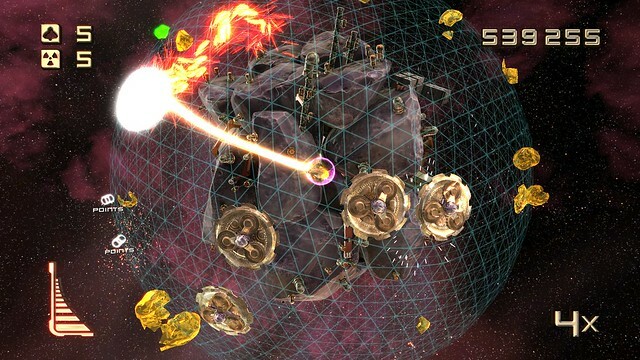 When Super Stardust on PS3 added stereo 3D, it was just amazing. It would be mind-blowing to play it in stereo 3D in 1080p @ 60fps! On the flip side, if this is another port from PS3 that *removes* stereo 3D, then our suspicions will be confirmed: Sony is actively discouraging stereo 3D support on PS4 due to un-fixable GPU driver bugs :( I was so disppointed when the Flower port didn’t have stereo 3D. I’d really love to see Blast Factor come to PS4. That game had the best audio assets and surround sound design of any PSN game I’ve ever played. HELLZ YEAH! Don’t get me wrong gang; I really did enjoy Resogun. But SSDHD is just wasn’t; that game was like crack to me on the PS3. Four years after I got the console and I was still playing it (got into a high score battle with several of my friends), and looks like I’ll be back in action come next year! Please don’t rush. No jaggies please! 3D confirmed. Now let’s hope 3D is also confirmed for Housemarque’s next game, Alienation. Hold on…the same f****** game?….sorry no thank you….so you bring 2 good news.”new DLC for Resogun & Resogun for Vita and PS3″ and one terrible.More recycled games for PS4 and worst of all…a Vita exclusive title.Dunno why I am surprised though…this is just Sony making sure that Vita coffin is under the soil. Should’ve get Housemarque to make a new one for PS4…now THAT would’ve been good news. OMFG! I’M IN HEAVEN!!! BEST PSN GAME IN HISTORY! YESSSSS! Another step closer to retiring the PS3. Yay! Have it on PS3 and VITA. Such a great game. Please let it be in 3D as well. This better be in 3D or im not buying it and will be really ticked off. This was the best 3D game on the ps3 by far. I really think they should support 3D games more on the ps4 this would be an huge start if they make this 3D and id be so happy.